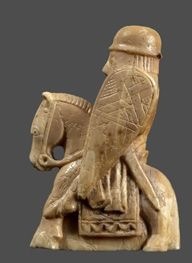 I'm planning to have a reconstruction made of the type of helmet seen on the Lewis Chessmen and the carving on the 12th century church door from Valþjófsstaðir in Iceland. I was wondering if anybody would have any other references that might cast light on the nature of the rounded cheek and neck guards seen on these helmets (Well, in the caving from Valþjófsstaðir the shape of the neck guard is not visible but the helmet does have a neck guard and I'm assuming it would have been similar to that of the Lewis chess men since they were made around the same time as the Valþjófsstaðir carving and the Lewis chess men probably came from Norway or even Iceland. None of the Lewis chess men except for one of the knights seem to have helmets with a nasal. From the looks of them they Lewis chess men all have helmets beaten out of a single plate. You'd think the artists would have carved 'spangen' on the helmets the Lewis figures wear if helmets with composite domes were common in this era. The cheek/neck guards look like they were made of steel but one of the knights seems to have ones meant to look like they were made of leather or cuir bouilli. 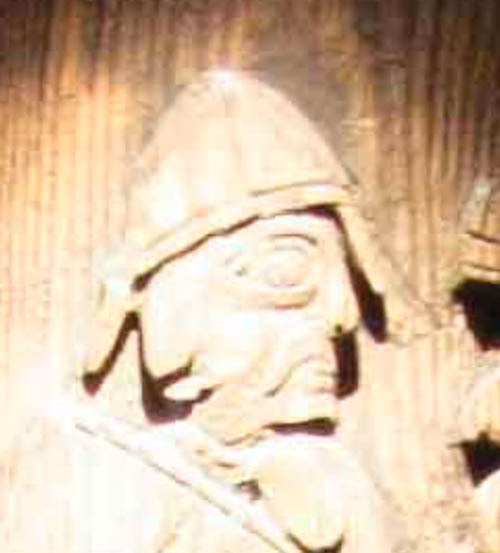 The upper knight in the Valþjófsstaðir carving seems to have a 'classic' spangenhelm with a nasal. I've been experimenting with gluing cardboard cheek and neck guards to my nasal helm and I'm pretty sure the cheek and neck guards were suspended with leather hinges from the helmet dome rather than rigidly welded or riveted to the helmet dome. It also makes sense that they were flared outwards at the bottom because otherwise the bottom of the neck guard in particular catches on your clothing. I'm still on the fence about the material these cheek pieces were made of. Generally I am skeptical about leather and I'm going with metal but after conducting some experiments of my own I have concluded that when it comes to things like cheek and neck guards there is something to be said in favour of really tick 5-6mm thick bovine leather (without even hardening it) even if I have never seen any real evidence of such armour. 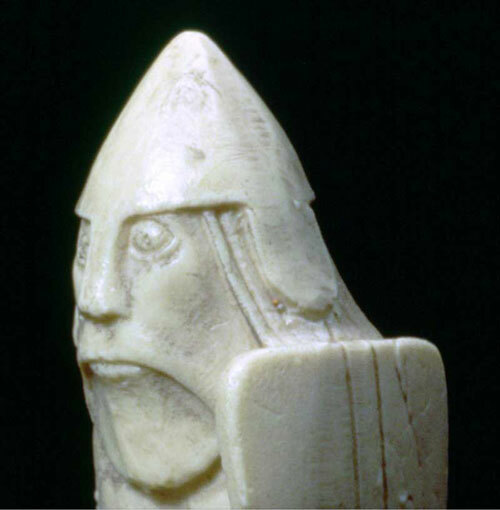 I'm not sure the Lewis Chessmen can tell us much about fighting equipment; they are pretty heavily stylised. If we interpreted them literally we would conclude that their fighters were all dwarfs with pointy heads. But lovely they are. I just love the berserkers, biting their shields. A phrase that turns up in the icelandic sagas some hundred years later. Hi, really nice to see more people finding an interest in the arms and armour on the Lewis pieces. I’m putting together a kit for the Norwegian civil war and have done quite a bit of research into this time and place. 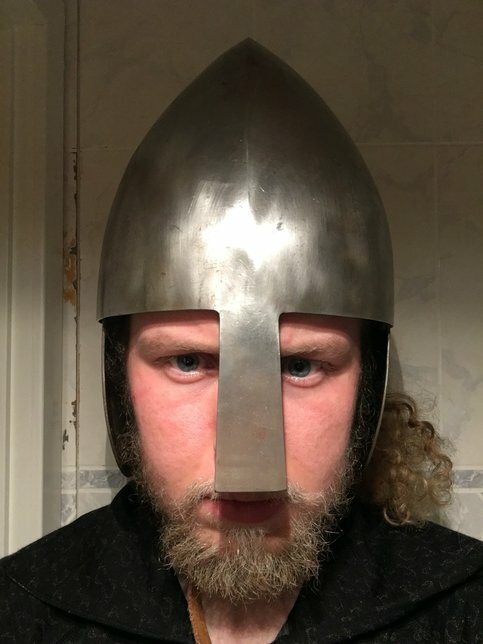 Further, the term “iron hat” or “steel cap” and variations are normal ways to describe helmets in sagas of the period as well including Sverres saga (1170s-1202) and Håkon Håkonssons saga (1204-1261). 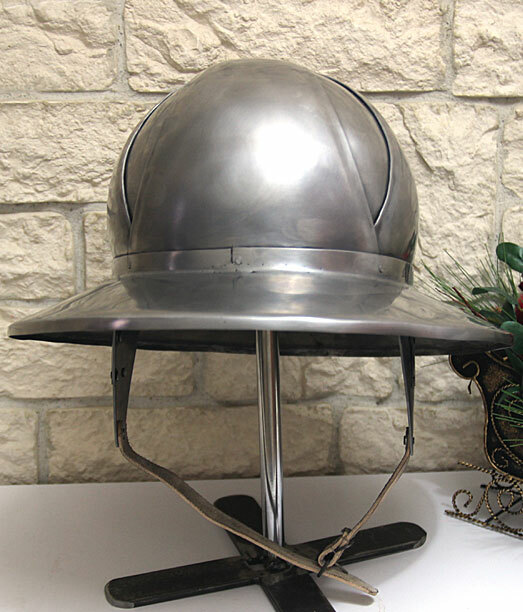 A clue to a possible differentiation of steel cap and helmets can be found in the later laws of militias and the royal retinue from the 1270s where steel caps are required of mid-wealth soldiers but helmets are an optional extra for knights and barons, possibly interpreted as the term helmet being reserved for more enclosed headwear like great helms and similar. Lastly I attached a picture of my own helmet, co-designed with and fully produced by Jeffrey Hildebrandt at Royal Oak Armoury. You’re quite right in that leather suspension works and that the back should be curved. It works. Thanks for the reply, that German kettle-ish helmet looks about right for that squire. 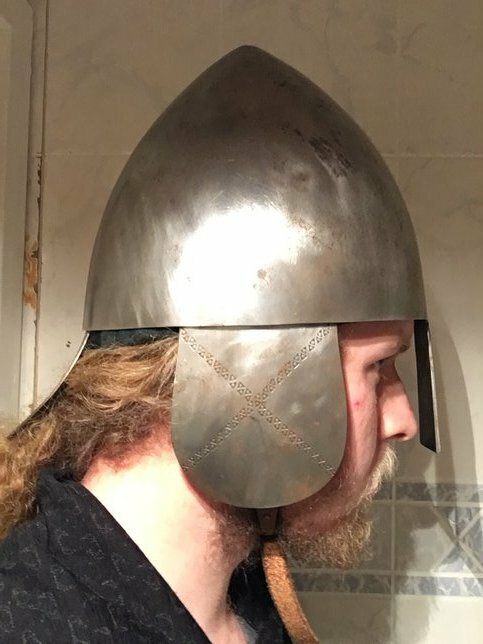 I just had a helmet made by a smith in Poland that is a replica of the one from Hof in Norway (attached), I figure it might also be a fit for that squire figure but I mostly got it for the 1200-1350 period and not for 12th century events. The lobes were not much longer than a nasal that reaches just below the nose, any longer and the get in the way. It helps if lobe at the neck is flared out at the bottom and it must either be riveted directly to the rim of the helmet or attached to it with a thick piece of leather because if the lower end of the neck guard falls down down onto your neck when you look down, the end of the lobe catches on the neckline of your tunic when you look up again which is really annoying and most reconstruction illustrations of these helmets I have seen don't account for this. Riveting a strip of leather to the helmet rim and then riveting the neck guard to that would be better than riveting the neck guard rigidly to the helmet since the leather flexes a bit an allows you to look up which a neck guard riveted directly to the helmet would not do. If somebody whacks you full force directly on the cheek piece with a horizontal slash of a sword or an axe you're pretty much dead. The side and neck lobes still give good protection against moderate blows to the side of the head and glancying downward slashes that otherwise would leave you with a horrible head wound. Personally I'd recommend drilling holes in the sides of the lobes and sewing padding to the inside of the side lobes and the neck guard. That might also solve the problem of the neck guard catching on your tunic but in the absence of any surviving helmets like this complete with neck guards that's just a suggestion. Another idea is to wear a coif under this helmet but the Lewis figures are clearly not wearing one. The side lobes do not impair hearing to any serious degree. These lobed helmets actually seem to be a pretty nice solution for soldiers in a shield wall (even if the lobes were made of 5-6 mm boiled/hardened leather) if you don't have mail coifs available. 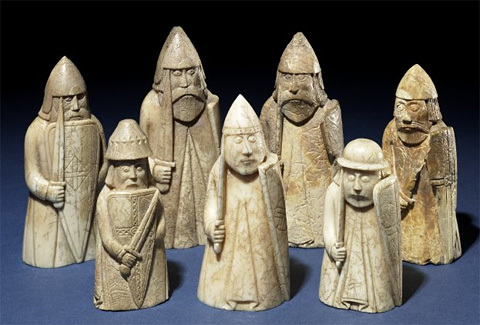 Since most of the Lewis chessmen only seem to be wearing tunics this makes sense. They sure beat wearing only a basic spangenhelm with no neck/cheek protection and no mail coif. 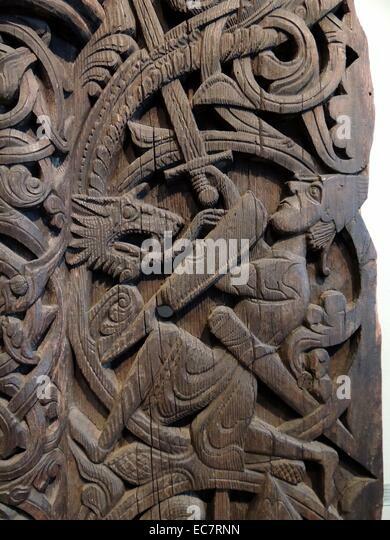 Here's a better picture of the relief carving c. 1200, housed in the National Museum of Iceland. Sorry for delayed post. Hard week back at work after too long off. I have gotten some use from it, although mostly in combat styles without headshots I've participated in a couple of fights where it did get to show its virtues and I'm really happy with it. In the first two pictures you can see the length and curvature of the lobes on mine. They work very well and I've never had any issues with them. Although they're not fastened hard they also give a fairly good protection, but you'd at the very least be dazed by a full on swing and they're not set up to stand against maces for example, but then again they're from a time and place where maces weren't a big thing for the most part. The lobes are also sligthly overlapping with the rim so they don't flap about all over the place every time you move your head a bit fast. The last picture is of the inside, it's more or less as you predicted, but he only used 1,5mm thick leather or so. It's rigid enough but the back plate might need a fix at some point. No, the lobes doesn't impair the hearing too much, but it does make the sound a bit weird. A friend of mine is rather convinced this is a quick fix done by norwegians who couldn't afford or saw the need to upgrade their old nasals to the new fighting styles of cavalry and lines of kite shields to completely new equipment and just slapped some plates onto the old ones instead. Whether such helmets were actually used or not, that is an excellent ode to the chess pieces, and I think it looks great!